Reign – Close up on me ! Hair : DOUX – Astra – Blondes Pack . By David Cooper (dam1710) NEW!!! 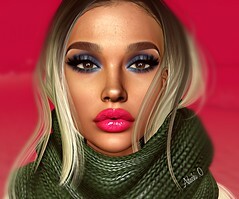 Lipstick : COLIVATI BEAUTY – Pouty Lipgloss Pack 01.By Colivati COMING SOON! Face Pose : FOXCITY – Bento Faces – Pose HUD 1. By Satomi Masukami @ON9 EVENT Wear the event tag to get it for FREE!!! Pose : K&S – Candy Poses 1 . By KatyaSessions NEW!! Bodysuit : IAF – Sheer Leotard (Blue) with appliers at The Designers Market! !